﻿ H.G. de Wolff - Happiness quantified"
Happiness quantified is a disconcerting book. A short background sketch is needed in order to justify this assertion. In the second half of the nineteenth century the marginalist theorie became popular at a tearing pace among economists. She relates the economic behaviour to personal preferences, and for this reason is also called the subjective theory. People try to behave in such a way, that they maximize as much as possible their own utility or lust. This not only explains why people mutually exchange their properties, but it allows also to derive a system of product prices1. The marginalist paradigma, which presently is often somewhat confusingly called neoclassical, has various far-reaching consequences. Notably the find of the utility evaluation suggests, that the total quantity of utility for a person can be measured. Or in other words, a measure exists for the personal satisfaction. Next it is a small step to suppose that the interpersonal differences in satisfaction can also be determined. And this allows to motivate the need for redistribution, in the name of justice. It questions the property relations, and consequently the whole social structure. In final instance a social welfare function comes within reach. Moreover the subjective character implies that the psychology can be applied. That professional domain is highly speculative. It undermines the ambition of the economists to find immutable principles, that can justify the existing order. In Happiness quantified Bernard van Praag and Ada Ferrer-i-Carbonell describe how the marginalist economists tried to avert the danger. First of all, the Italian economist Vilfredo Pareto argued that for a clear understanding it is unnecessary to directly measure the utility and the satisfaction. It suffices to order the individual preferences according to their priority. Such a scale is called ordinal. After Pareto other marginalists began to restrict the utility measurements even more. Especially the economist Lionel C. Robbins has contested the quantitative measurability (called cardinality) with might and main. His assault has been welcomed, since she transforms economics into an objective science. The statement of Robbins and his adherents has become more or less a dogma, and the cardinality was rejected2. Yet the victory is not permanent. For the problem is that some branches of the economic science can only develop, if a cardinal utility is accepted. The restrictions of Robbins make that research impossible. Bernard van Praag, who is the driving force behind Happiness quantified, proposed already in 1968 to measure satisfaction simply by asking the people for an evaluation. This method for measuring satisfaction is common in the sociology and in the psychology, and it attaches (if desired quantitative) values to the emotions of the subjects. Van Praag has turned this research method into his destination in life, even after his retirement in 2004. His work is versatile to such a degree, that his publications are spread over many domains of science. Those interested may be grateful, that he has taken the trouble to collect his inheritance in a book, and to make her accessible. The consequences of his work are so impressive that the Nobel price seems within reach. 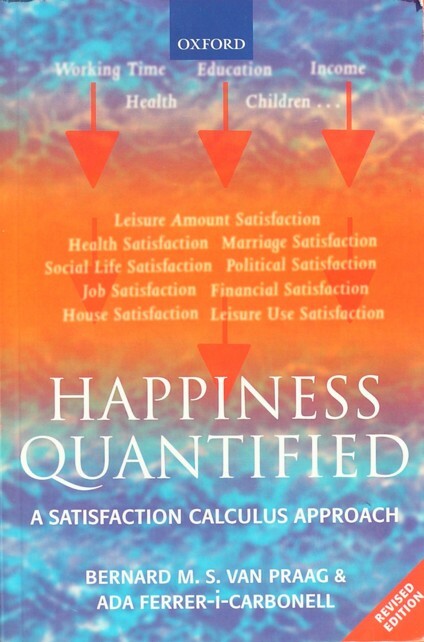 Nonetheless Happiness quantified has not yet reached the top-ten in the list of scientific books. How is that possible? Apart from the personality structure of Van Praag (who is not an acquaintance of your reviewer) the technical character of the matter is a blockade. The work makes an intense use of advanced statistical methods, and that discourages outsiders. Conversely, technical experts will be discouraged by the many applications. Van Praag likes to apply knowledge, and is a driving force behind among others noise research in the vicinity of Schiphol and polls by the newspapers of the GPD. And finally the work is interdisciplinary, balancing between economics and sociology. Unfortunately such a position does not help. The method measures the subjective needs, but still the researcher must design a framework. For the polls require lists of specific questions in order to collect precisely the determining data. It does not suffice to measure the satisfaction, because the causes behind the lust and discontent must be revealed. The happiness economics wants to establish the causal relations, because that is her reason of existence. The situation of the subject must be fixed in a minimal number of marks. The particular theme will determine the success of this approach. This imposes a large responsibility on the researcher, for a flawed choice of the situational marks would conceal the real causes. That has severe consequences. For the happiness economics has the ambition to steer the policy formulation of the politicians. It would be a nightmare when lobbyists and pressure groups design their own polls in order to prove their right. The method is only fruitful, when a broad consensus is reached and thus a standardization with regard to the lists of questions. This aspect is barely addressed by the book. Its main aim is to be a pioneer. Perhaps the next book can fill the gap? Which policy domains are addressed in Happiness quantified? Van Praag began his early research by studying the income distributions, which will appeal at least to the economist. In chapter 2 Van Praag introduces the statistical probit method, applied to the income satisfaction. Here he describes also supplementary methods, such as the income evaluation question of the Leyden School. Their application on already existing data yields indeed surprising insights. Although the satisfaction really rises with the height of the income, the correlation is weak. The personal attitude towards the situation is decisive3. That explains naturally why the leftwing policy of redistribution fails so often. Van Praag en Ferrer-i-Carbonell investigate also other domains of satisfaction, notably with regard to health, jobs, the private property, housing, recreation, the environment (among others the inconvenience of noise), society, marriage, politics, the climate, and taxes. The chapter 4 summarizes the results. The method is indeed applicable for any arbitrary domain of life4. Besides the chapter 4 shows ways to measure the relative influence of a certain domain with respect to the general satisfaction with life. Conversely the method can be employed for the separation of a certain domain satisfaction into subdomains. For instance the authors dissect the job satisfaction. The next chapters analyze the political satisfaction, the differences between the sexes, the influence of the past and future on the needs, the influence of reference groups, and the health satisfaction. The chapter 10 studies the influence of climate on the personal wellbeing. In chapter 11 the annoyance of noise for the communities around Schiphol are addressed. Here some practical flaws of the method become clear. Namely Van Praaf tries to compute the financial compensation for the concerned residents. Here enormous financial interests are at stake. Now the chapter shows that the general satisfaction of the redisdents does not depend on the local noise level in a statistically significant way! This result will not make the researcher popular with the residents. Next Van Praag investigates the relation between the experienced annoyance of noise and the noise level, and she does show a significant correlation. And finally by means of this intermediate step of the experienced annoyance a significant correlation with the general satisfaction is constructed! This surprises your reviewer, who can not explain this statistical detour, without lapsing into a complete rejection. Any way the discussion about the annoyance of noise threatens to get lost in a debate about sound statistical methods. The chapter 11 is an abstract discussion about the tax system, which proposes to tax the citizens according to their intelligence and their ability to learn. The chapters 13 up to and including 16 present again spectacular theories, because there the method leads to the construction of a scale for income inequality and poverty. The indicators, which are presently available, are primitive (see for instance the work of Van der Wijk), and therefore the approach by means of the subjective utility (although thus apparently somewhat controversial) is definitely an improvement. The reader has undoubtedly grasped that your reviewer makes a warm recommendation for Happiness quantified. It must be admitted that the book uses many awkward and advanced statistical techniques. Not everbody will appreciate this. But this is compensated by the many applications, that reveal many surprising causal relations of discontent and lust. Many of the results are indeed controversial. Nevertheless, they are valuable, because they illustrate the potential of the method, at least as long as they are applied with care. Perhaps the most important message of Happiness quantified is that the economic science has been muzzled for years by the dogma of Robbins and his adherents. The cardinal utility measurement does prove fruitful, and it yields a valuable contribution to the extenstion of the horizon of our knowledge. In general dogmatism is used to protect certain material interests, and that is irreconcilable with the task of science to give a rational picture of society. Incidentally the cardinal utility measurement is not an obligation. Many applications in Happiness quantified are possible with the more restricting ordinal scale.